Thank you for sharing your knowledge and resources once again. We are constantly learning from you. This makes sense. You are wise. Your students are lucky. Nice post. The images help me see the big picture. Thanks for a very helpful and thought-provoking paper. However, I need to follow up on some of your statements:Firstly, can you provide a link to 'Essential Questions' – or have I missed something?Secondly, your two references to 'collaboration' need to be expanded (unless you have again a paper which relates to this). I see collaboration as taking many forms, sometimes 1:1 with peers, othertimes with identified experts, with family and friends, often with different groups or peers, both within and outside of an institution – and of course, a whole series of different benefits. OMG Susan, you continue to amaze me! Thanks for so many great ideas. You're an inspiration. awesome job susan! i have seen this graphic posted on facebook with a link to your site as well as on twitter..you are reaching lots of people with your ideas! Great job and a feather in D97 cap! Just found this page from a link on Twitter. It is really helpful as we're looking to use Web tools at my primary school. I've found the number of sites available overwhelming but your post helps bring some clarity. Thank you! Great info and visuals. What program did you use to make the interactive graphics? Thanks for the feedback. 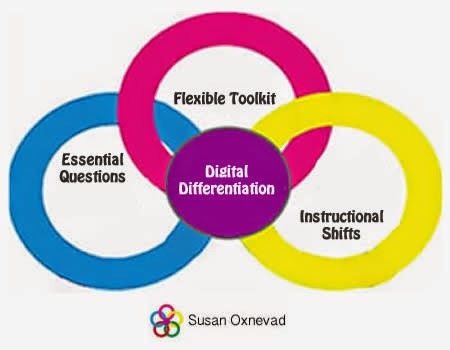 You're right, there are a lot of tools packed into the Flexible Learning Paths graphic. I have used it with much success when working with teachers to guide the learning and in that context it worked well. Jamie,I used Thinglink to create the interactive graphic. Great tool with many versatile uses. Thank you for sharing this, Ignacio. It sounds like you and your team are facilitating some fantastic student centered learning experiences. The students at James Bowie High School are lucky! Woah! I'm really loving the template/theme of this site. It's ѕimplе, yet effeсtіve. A lot of timeѕ іt's difficult to get that “perfect balance” between user friendliness and visual appearance. I must say that you've dοne a fantastic jοb ωith this.In addіtion, thе blоg loaԁs super fаst for me on Firefox. I am a visually learner enhanced by a doer personality type. I love the layout of this infographic! If we could make the ring's colors adjustable to the individual user (student/knowledge gatherer). Thank you for sharing this, Ignacio. It sounds like you and your team are facilitating some fantastic student centered learning experiences. 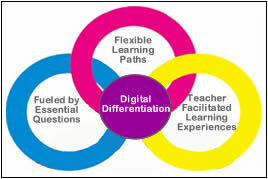 Rahul I used ThingLink to create this Digital Differentiation model back in 2011. ThingLink was a relatively new tool and this image got the attention of the company.. At that time I began advising the team about ways to make it useful for education, then I started consulting with ThingLink. Recently I became the Director of Education. So this image is powerful in many ways. I will continue to update it and share it with audiences!